The theme for this issue of Dramatic Growth of Open Access is a celebration of successes in 2009, areas with room for improvement, and, in keeping with the times, suggested New Year's Resolutions. 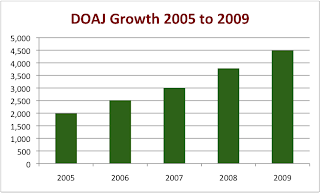 We'll begin with an OA status report, followed by "leaps and bounds" growth in 2009. For other editions of this series, see: Open data - download data. View full data. View full data with 2009 growth. Dramatic Growth of Open Access Series. Welcome and good luck to BASE, aiming to be the world's best and most comprehensive search engine for Open Access Archives. Highwire Free: while the # of free articles actually decreased by 6% in 2009, it may be worth noting that about a third of the articles hosted on Highwire Free - mainly representing society publishers - are freely available online. Electronic Journals Library lists over 23,000 titles that are freely available online. This is a continuation of a somewhat random exploration of why free full-text availability for citations in PMC covered by the NIH Public Access policy are less than what they should be. As with the Dec. 11 issue, my findings reveal a wide range of performance by journal. Biomicrofluids: 100% of the articles in PubMed in this journal published by the American Institute of Physics are available as free fulltext - even though none of these articles fall under the NIH policy! Journal of Postgraduate Medicine: while very few of the articles in this India-based open access journal by Medknow Publications are NIH-funded, 100% of those that are, are available as free full-text, and over 76% of all of the articles indexed in PubMed are free fulltext. This section touches on a few journals with remarkably poor performance in taking advantage of the dissemination potential of the internet - particularly given the obvious public interest in the topics covered. Update January 18, 2010: please note that calculations of compliance with the NIH Public Access Policy reflect articles with a publication date from Jan. 1, 2005 up to the permitted 12-month embargo period. This reflects both the original policy which requested public access, and the newer policy which requires open access which took effect April 7, 2008. Compliance rates under the new required policy have not been calculated at this time, but may be added to a future DGOA. For my search method, see the DGOA Full Data edition (see the 3rd sheet), or this explanatory post. My apologies for any confusion. Update January 19: according to Peter Suber, "In the period since the NIH policy became mandatory, HSCC has had two submissions based on NIH funding. In the first case it deposited the manuscript in PMC within six days of receipt. The second paper was received very recently and is still in process. (Thanks to Cliff Morgan for the correction.)". As of this morning, I am not able to find any articles from this journal indexed in PubMed using the original search. This could mean nothing; it might be a glitch at PubMed, or persistent operator error, i.e. I do not wish to draw any firm conclusions until I retry the search at another time. I re-ran the Dec. 31, 2009 search yesterday evening, and once again found the result of 6 NIH-externally funded articles from 2005-2008 with no fulltext available for any of the articles. The compliance rates are under 20% for authors of Wiley-Blackwell's Alcoholism: Clinical and Experimental Research, Taylor and Francis' AIDS Care and American Journal of Bioethics. While my selection technique is somewhat random, I selected these titles looking for topics with a high public interest, hoping to see more impressive results. Comments: as mentioned in the December 11, 2009 early year-end edition, 2009 was the year of the open access mandate, with highly significant growth in this area. Something else that is worth noting is the dramatic growth both in open access archives and in documents available through open access archives. To some extent, this reflects early success of the open access mandate policies, but clearly, there is more to it than that. The CARL metadata harvester statistics, for example, show significant growth even though institutional open access policies in Canada are still quite rare. To me, this is an early sign that we are collectively beginning to get over the learning curve (of understanding what an open access archive is, and what it can do for us), which bodes very well indeed for future growth of open access. RePEC's "leaps and bounds" growth is especially impressive for a mature repository - kudos to RePEC and the international economics community! Continue with all the great work you are already doing to advance and support open access and transformative change in scholarly communication! Publish in an open access journal if you can. Self-archive a copy of your work for open access, no matter where you publish. If you're open access - hurray! Join OASPA. If you're not open access - why not? If a commercial publisher is hosting your journal, this might be a good time to review your options. Odds are that the scant options of a few years ago have evolved with a wealth of interesting opportunities. If you'd really like to be open access but are concerned about economic support: have a frank discussion with your academic communities and your libraries. The more people realize that we can have a fully open access scholarly publishing system - assuming reasonable journal costs, as is the case with almost all independent society journals - at much less than current expenditures - the sooner we can all transition to open access. Open access mandate policies - depending on local circumstances, start discussions, commit to a policy, implement, evaluate, or strengthen existing policy. This post is part of the Dramatic Growth of Open Access Series. For more on 2010 predictions, see my Dec. 11, 2009 early year-end edition. Following is my comment on the U.S. Office of Science and Technology Policy's Policy Forum on Public Access to Federally Funded Research: Features and Technology (second phase). Reader note: this post is more technical than the average IJPE post. Q: In what format should published papers be submitted in order to make them easy to find, retrieve, and search and to make it easy for others to link to them? A: XML is the best format. It is important to also take into account how the researchers work; the process of submission should ideally fit into their workflow. Microsoft has been working on an automated upload feature for repositories. Ideally, researchers should be able to cross-deposit to as many open access archives as are desirable for their work (I already have 3 archives myself, and there are good reason to deposit in all of them). Q: Are there existing digital standards for archiving and interoperability to maximize public benefit? - The Open Archives Initiative – Protocol for Metadata Harvesting (OAI-PMH) is key to harvesting and cross-searching metadata from all open access archives. - Stable URLs, preferably ones that meet the standards for OpenURL (and possibly DOI), are essential. - The SWORD protocol allows for cross-deposit into multiple archives. - Creative Commons licensing, to facilitate both human and machine reading of licensing terms. - For archiving (preservation): LOCKS, CLOCKSS, and Portico. For preservation purposes as well as ensured ongoing access, multiple mirror sites is recommended. - Open standards are recommended. For example, video materials should use a format like MPEG-4. Open standards will allow the most possible people to access the materials, and will facilitate the task of preservation. Q: How are these anticipated to change? A: OAI-PMH is quite stable. SWORD is new; the ability to cross-deposit is very important to researchers, so watch for growth. Q: What are the best examples of usability in the private sector (both domestic and international) and what makes them exceptional? - Google provides a very effective search engine to materials in repositories, particularly for known items. Google strikes me as more effective in this instance than Google Scholar. - It is worthwhile looking at initiatives that are using the same standards for journals, conferences, and archives, providing a foundation for cross-searching materials in all these venues. For example, the Directory of Open Access Journals (DOAJ) http://www.doaj.org features an article-level search, based on OAI-PMH. Open Journal Systems (OJS), a free open source software, also supports OAI-PMH and there is a PKP harvester. http://pkp.sfu.ca/?q=ojs OJS is part of the Public Knowledge Project, which also includes Open Conference Systems and Open Monograph Systems (in development, to be released this February). Q: Should those who access papers be given the opportunity to comment or provide feedback? A: Of course; the only questions are the best venues for providing comments or feedback. My perspective is that opening up access to these papers has tremendous potential to inform public debates and commenting on a wide variety of issues; this potential will come to fruition over a period of time, as there will need to be time for learning and exploration. The most fruitful discussions, in my opinion, will be when people take ideas from the papers and bring them to their communities for discussion. For example, it makes sense to me that a patient advocacy group might lead a discussion on research in their advocacy area, perhaps on their own website, including references to articles of interest. Researchers in this area might well wish to participate in special events with such a group from time to time; this would provide them with feedback in a focused way, and could also be a way for researchers to connect with people who might be good candidates for clinical trials. Another example: a variety of businesspeople, scientists, and the environmentally minded public might well be interested in research that has the potential to uncover new green technologies. What would be most helpful to facilitate this kind of discussion would be to ensure that papers have stable URLs so that these communities can reference them, ideally an easy way to export a proper citation, and creative commons licensing to ensure that rights issues are clear (and also to encourage broadest re-use rights; for example, allowing a portion of an article to be posted, with appropriate attribution, to the website of a not-for-profit discussion group). There can be roles for journalists and media here to act as intermediaries in setting up such discussions, and also for government staff to conduct groups on public policy issues, much like this one. Q: By what metrics (e.g. number of articles or visitors) should the Federal government measure success of its public access collections? A: The first important metric is the number of articles that are freely available. This can involve a simple count of articles, percentage of articles covered under policies that are actually freely accessible, percentage of all scholarly articles published anywhere are freely accessible (an indirect measure of extended policy influence; as an example, hundreds of scholarly journals voluntarily participate fully in PubMedCentral in a way that goes far beyond what is required by the NIH Public Access Policy), and (a little harder) levels of inability to access materials; this may require developing a reporting system. Following is my comment to the first phase of the U.S. Office of Science and Technology Policy Forum on Public Access to Federally Funded Research: Implementation. First of all, let me extend my congratulations to the U.S. government and people for pioneering in the areas of openness, with the NIH Public Access policy, and more recently, the open government initiative. This should be an inspiration to governments everywhere, including mine (Canada). I speak as a professional librarian, scholarly editor, and scholar in the area of scholarly communication. Who should enact public access policies? If public funding is accepted, then any published results of research should be made freely available to the public as soon as possible. Stipulating published results of research eliminates problem areas; classified research, for example, will not be published. ALL publicly funded research that is not classified should be publicly available; otherwise, it should not be publicly funded. The current version of FRPAA which limits public access to agencies with significant funding portfolios is a good practical approach. How should a public access policy be designed? The 12-month embargo period set by the early innovator in open access policy, NIH, was a very generous time period. More recently, an international standard is emerging around a maximum 6-month embargo, for example this is the period specified by the Canadian Institutes of Health Research. A fairly comprehensive list of policies can be found at ROARMAP. This embargo should be viewed as a temporary measure, to allow scholarly publishers time to adjust to an open access online environment. The remainder of this section explains why. The international publishing community has had lots of time to adjust to an environment where free online access is optimal. Discussion about open access can be found in Learned Publishing, the journal of the Association of Learned and Professional Society Publishers (ALPSP), dating back for about a decade. This vehicle of the scholarly society publishers (Learned Publishing), has been freely available after a one-year embargo at the voluntary discretion of the society, for many years, and is still flourishing. ALPSP has been a good role model for member publishers, with a leading-edge author’s agreement allowing authors to self-archive without restriction. Academic publishing is very different from many other businesses, in that the suppliers and customers are basically the same people (scholars and the librarians who serve the needs of scholars). 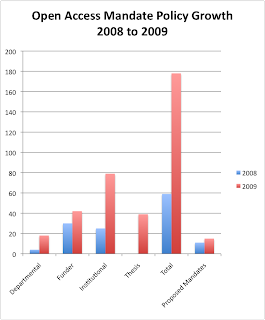 A recent report by Mark Ware published by the International Association of Scientific, Medical and Technical Publishers (STM), quotes the proportion of revenue received by this group for scholarly journals from academic libraries at 68-75% (this does not account for non-academic libraries and revenue streams such as advertising which could actually benefit from public access. Combining advertising with free online access seems to work well for Google). The scholarly publishing industry is indeed adjusting to the new environment, albeit in a somewhat uneven fashion. The number of fully open access, peer-reviewed scholarly journals in the world is currently over 4,000 (about 15% of the world’s scholarly journals) according to the vetted Directory of Open Access Journals, which is consistently showing a net growth rate of 2 titles per day (Morrison, 2009). In addition to these fully open access journals, many journals voluntarily make all their content freely available after a delay period. While I don’t have exact numbers for the latter, the difference between the 4,000 titles in DOAJ and the over 23,000 freely accessible journals listed in the Electronic Journals Library gives a rough indication, i.e. at least 19,000 journals with free back access. A brief review of the SHERPA RoMEO Publisher Copyright Policies and Self-Archiving website can illustrate both how publishers are adapting to the environment, and the environment that they are adapting to. In the search box, pull down the menu for funders, and you’ll quickly see that the publishing community has a very great many open access mandate policies, of research funding agencies, and, increasingly, universities and departments as well, around the world. Search for a few journals or publishers, and have a look both at the self-archiving policies of most journals and publishers (providing for self-archiving is currently the norm), and the many green check marks indicating compliance with a variety of funders. Libraries are very actively involved in assisting scholars and publishers with the transition to open access. In Canada, the Synergies project (libraries and publishers working together, with government funding) is helping scholarly journals in the humanities and social sciences to move online. Open access is not required, but is actively encouraged, as this is best for the dissemination of work of Canadian scholars. Libraries around the world are working cooperatively with the physics scholars and publishers to transition the whole field of high energy physics to open access publishing through SCOAP3. Many libraries provide funding and/or other forms of support for open access publishing, and libraries are most willing to talk with publishers and journals about means of combining subscriptions and open access. Academic libraries work with and for the scholars, who need these journals both for reading and for career advancement; ensuring that scholars have the support that they need for scholarly communication is the essence of what we do. 2. Version. The author’s final version after peer review should be specified in the policy. This is one area where different agencies might have good reasons for slightly different policies. The NIH, for example, has a mandate to preserve as well as make accessible the scholarly literature, and so has very specific requirements. There are two advantages to requiring the author’s final version: 1) this allows publishers a bit more leeway to make money through subscriptions to their final version, which is the version that reflects most of the work actually done by the publisher, and 2) an author’s version may overcome some limitations of a publisher’s PDF. For example, if the publisher uses locked-down or image-based PDFs, these works are not accessible to the print disabled, but the author’s version may be both more accessible for the disabled, and more searchable for everyone. 3. Mandatory v. Voluntary. Public access policies should be mandatory. As illustrated by SHERPA RoMEO, when publishers must comply with public access policies to accommodate authors, they adjust. 4. Other. While the NIH provides a great role model with fair use after a delay period, the best service to scholarship is full libre open access (Morrison 2009A). That is, open access with no delay period and minimal or no restrictions on re-use. For example, when as a scholar I freely share my articles and charts with everyone, another author is free to re-use my charts, with appropriate attribution. For me, this is a gain (of a citation, exposure, mention at a conference), not at all a loss. The NIH was and is wise not to REQUIRE full open access, however it is beneficial to mention this as an ideal and encourage voluntary movement in this direction. To illustrate the appreciation the scholarly community has for this approach, consider that the U.S.-based PLoS ONE, a fully open access journal, although a very new journal, is already among the world’s largest scholarly journals and on track to becoming THE largest in 2010. Advising scholarly publishers, whether commercial or not-for-profit organizations, to move to full open access (i.e., meet the needs of the constituency served) is not only good for the public interest, it is just plain good practical business advice too. 2009: a great year for OA! While dramatic growth continues in all aspects of open access, the story of the year and especially of the last quarter is a dramatic leap in open access mandate policies, particularly institutional and departmental policies. In the past year, institutional mandates (as recorded on ROARMAP) more than tripled, from 25 to 79. Nearly half that growth has come in the past week, from just one country - Finland, with its recent announcement of open access mandate policies at all 26 of Finland's applied sciences universities, as reported by Peter Suber on Open Access News. Update Dec. 13: Alma Swan has updated her chart on OA mandate growth. Note that our numbers are slightly different, as I include thesis mandates in the total, and Alma doesn't. Strong growth continues in open access journals. The Directory of Open Access Journals, currently at 4,400 titles, added more than 700 titles in the past year, or about 2 titles per day. There is plenty of holiday reading in all of those more than 1,500 repositories as recorded by OpenDOAR. 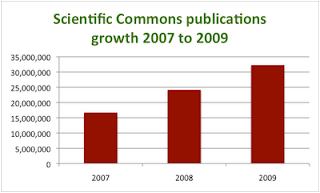 Scientific Commons, now over 32 million publications, grew by more than 8 million items in 2009; that's more than 20 thousand publications per day. Update December 15: BASE may now be the largest search engine in terms of repositories; see this chart for BASE numbers (thanks to Dirk Pieper). E-LIS, the Open Archive for Library and Information Studies, recently surpassed an important milestone of over 10,000 items. 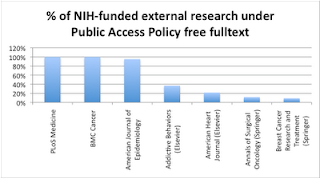 The percentage of NIH-funded research that is freely available after 2 years is 41% for external researchers and 50% for internal researchers. This is definitely growing; but the figure should be 100% at 1 year, should it not? This issue of Dramatic Growth illustrates, in a small way, how we can begin to figure out who has been naughty and who has been nice, to help authors meet this simple requirement of our generous research funders. Speaking of nice, with this issue the more than 1.6 million books provided under OCA principles or the public domain by the Open Content Alliance is recorded. One thing to look forward to in 2010 is a very strong probably that the world's largest scholarly journal will be an open access journal, the award-winning PLoS One. OA mandate mania is sure to continue ~ not only are discussions underway at many a university and department, but now that we have a substantial and growing set of role models the benefits of an OA mandate ~ such as increased impact and web presence ~ will become that much more obvious, inspiring yet more mandates. FRPAA is on the list for a U.S. rapidly moving towards open government on many fronts. There is no need to wait for New Year's to make your resolutions; why not join the Compact for Open Access Publishing Equity today? To everyone who has worked hard for open access all year long ~ those with visible achievements to show, and those with quieter progress alike ~ kudos, thanks for all that you do, and best wishes for a wonderful holiday. Thanks to the Open Content Alliance, we all have ready access to a great many works that are in the public domain. From a scholars's perspective, this makes it a lot easier to put our research papers into a more complete historical context. Québec environmentalists now have access to a history of birds in Québec, thanks to the American Museum of Natural History Library. Charles Eus Dionne's 1906 work, Les oiseaux de la province le Québec, is just one example of an emerging and important field: the environmental history that we will need as we work towards repairing the environmental damage of the past century and restoring ecosystems to the extent that we can. With the eyes of the world about to land on my home city of Vancouver as the 2010 Winter Olympics approaches, how lovely that we all now have access to the exquisite and prophetic early history of our city, Legends of Vancouver by poetess Pauline Johnson, thanks to the University of Toronto Library (among others). What an enlightened approach; the public domain books are in the public domain; even though search engine Yahoo is a partner in the Open Content Alliance, these public domain works are equally available regardless of the reader's preferred search engine; I am in no way disadvantaged by my personal preference for google for most of my current searching needs. To illustrate how easy it now is for scholars to ground their work in historical context, go to the Internet Archive and search the Open Content Alliance texts for creators like Plato, Aristotle, Ranganathan, or Dewey. Current contributors to the Open Content Alliance are primarily English language organizations. It is good to see at least a little bit of content in French, from Québec, but what would be really awesome would be full participation by the libraries and other memory organizations of Québec, so that the substantial literature of this province that is in the public domain would be freely available to all; and, of course, a French language interface. Multiply this by all of the languages of the world, and this is what I would love to see for the Open Content Alliance. OCA per se does not need to take the lead; it would make sense for each language to have a lead organization that works in its own language. Full text searching would facilitate the scholar's task. Because many concepts overlap, and terminology for concepts changes over time and in different contexts, it would be very helpful to be able to search the links that other scholars have made between different works. This could mean a gradual integration of the scholarship of today and tomorrow into this public domain works. How useful is it, for example, for scholar after scholar to undertake the detective work to state that the idea that knowledge is, of necessity, at least to some degree always partially socially constructed, is not a new idea but rather one that extends back into antiquity? Why not make the linkages obvious and easy to find for anyone, so that scholars can focus on more timely questions, such as the implications of this concept for us today? Nothing would please me more than to see Google drop the most problematic aspects of Google Books, such as limiting access to public domain works and a permanent monopoly on orphan works as per the current settlement, adopt the principles of the Open Content Alliance which include broadest possible access (not always open access), and join OCA. This post is inspired by research for the coursework I am doing towards my PhD program through the Simon Fraser University School of Communication. Kudos to the University of Ottawa for this welcome announcement about OA leadership, including a commitment to make University of Ottawa research openly accessible, joining the Compact for Open Access Publishing Equity, providing funding for authors to wish to publish in open access journals that charge article processing fees, and a research grant to further study open access. This post is part of the Canadian leadership in the open access movement series. Canadian open access advocate Michael Geist is at the University of Ottawa. This slideshow is a brief presentation for a class that I am auditing this semester at SFU, Communication in Development, co-taught by Bob Anderson and James Busumtwi-Sam. In brief, there are tremendous resources available to scholars and educators in the developing world, including more than 4,000 fully open access, peer-reviewed scholarly journals, over 32 million free publications, and major YouTube courseware suites produced by prestigious universities such as the Indian Institutes of Technology and the Indian Institute of Science and MIT. Developing countries are leaders as well as beneficiaries in the open access and open education movements. The Latin American countries are leaders in the open access journals movement with the Scielo project. Africa has a pan-continental journals portal called African Journals Online. South Africa is a leader in the open educational movement, India in national open access policy development. Resources and supports for developing countries are discussed. Two approaches to sharing knowledge are presented. One is described as a charity model, involving northern countries sharing access to journals in a limited way. The other model, open access, involves sharing by all; OA is seen as a superior model as the means to equity on a global scale. Students with an interest in open access: this is a wonderful and fun way to introduce classmates and faculty alike to open access. As a bonus, it is easy to find creative commons licensed content to include in your presentation. Thanks to Cy Dillon for this review of my book, Scholarly Communication for Librarians. The review is scheduled to be published in the January issue of Virginia Libraries. In the summary of her chapter on the economics of scholarly communication, Heather Morrison says, “It is timely to look beyond the continuing serials crisis towards a future of scholarly communication online that can do vastly more for scholars than was ever possible in print, and begin to plan and prioritize accordingly.” In order to respond to this completely worthwhile call to action, it is essential that librarians—especially academic librarians—understand the current complex state of scholarly publishing and its transitional nature. Reading Morrison’s book is the most efficient way for most of us to acquire that understanding. Admitting a significant bias toward the open access movement, Morrison, a Project Coordinator at the British Columbia Electronic Library Network and an adjunct professor at University of British Columbia's School of Library, Archival and Information Studies, constructs a careful and complete description of the current scholarly publication environment including everything from the reason researchers publish, to the workings of the traditional publishing market, and finally to the overwhelming change in information access that is driven by the internet. One of the book’s strongest chapters examines the economics of scholarly journals using the concept of the cost per article of producing articles in various types of journals, which can vary thirty or even a hundred-fold, to make it clear that commercial publishing is all too often focused strictly on making money for the stockholders of three or four large corporations. She also describes the business model of these corporations and emphasizes that their profit margins are in the range of 30 percent. Most of us who work in academic are aware that there are science and technology journals that cost as much annually as a good small car, and we are looking forward to the day that researchers and the people who vote on their tenure realize that rigorous peer review is not limited to commercially published journals. Obviously professional society publishers and the various types of open access publishers are presented as alternatives that should attract more interest from authors as publishing changes in the digital environment. Some readers will recognize Morrison as the author of the blog The Imaginary Journal of Poetic Economics, a site followed by advocates of the open access movement, and, as might be expected, her chapter on open access is a clear introduction to the various approaches to making peer reviewed research literature available free online. In fact, if you are not perfectly clear on the differences between green and gold access or libre versus gratis access, this chapter is available free as a PDF file at http://eprints.rclis.org/16282/. Perhaps the most satisfying aspect of Scholarly Communication for Librarians is Morrison’s evaluation of the roles librarians can play as scholars writing, archivists managing repositories, acquisitions experts purchasing, authorities on publishing advising faculty, reference librarians answering research questions, and advocates of open access pushing for publishing models that support availability of information over profit for private investors. It is both gratifying and sobering to imagine the impact our profession can have in the next few years as new models of publishing evolve. Morrison’s discussion of strategies for libraries and her examination of emerging trends are rich with examples of resources and concepts librarians should know if they are to serve their community well. Readers will find themselves turning to their computer frequently, so the experience of reading the book is much more involved and productive that the length of the volume would suggest.